Eight-hours is all it took for a St. Louis jury to hand Johnson & Johnson their largest legal setback yet for their talc-based products – a $4.69 billion verdict for the role J&J played in asbestos-induced ovarian cancer of 22 women. Unlike prior talcum trials, the Ingham v. Johnson & Johnson jury was the first to hear evidence that Johnson & Johnson covered up evidence that their “sacred cow” product contained asbestos fibers for more than 40 years. Medical experts testified that asbestos, a known carcinogen, is intermingled with mineral talc, which is the primary ingredient in Johnson & Johnson’s Baby Powder and Shower to Shower products. Plaintiffs’ experts explained to the jury that asbestos fibers and talcum particles have been found in the ovarian tissue of many of the women filing talcum lawsuits against J&J. According to Robert Dassow, a lawyer on the St. Louis talcum powder trial team, the jury was extremely attentive during the entire six-week trial. They listened intently to the testimony of asbestos and cancer doctors who explained the path to an ovarian cancer diagnosis through years of unknowing asbestos exposure through the use of J&J’s products. In the end, the six men and six women jury unanimously agreed that J&J hid evidence of the potential harm that could be caused by their products, according to Dassow. Mark Lanier, lead lawyer in the St. Louis trials, encouraged jurors to send J&J a message about their continued conduct. Lanier did not give the jury guidance as to an appropriate number that could both compensate a family for the devastating ovarian cancer diagnosis and act as punishment to the corporation responsible. Instead, the jury found their own way to send this message. The jury compensated each of the 22 women $25 million for the suffering they experienced from their diagnosis with ovarian cancer. The jury then came back with $4.14 billion in punitive damages, which they arrived at by multiplying a single year of talcum powder sales by the roughly 40 years since the company reported their products did not contain asbestos. 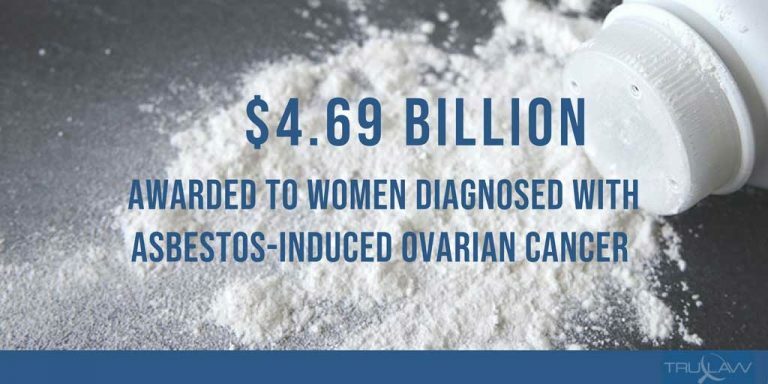 Johnson & Johnson continues to deny their product caused any harm – noting that the company “remains confident that its products do not contain asbestos and do not cause ovarian cancer.” But, juries continue to disagree with this statement and punish J&J for this denial. Prior to the St. Louis verdict, J&J racked up $867 million in losses in previous verdicts. Many of these prior verdicts have been overturned upon appeal by Johnson & Johnson. News of this unprecedented verdict caused the J&J stock price to correct during trading on Friday the 13th, falling in price by 1.43%. Statements issued by J&J indicate, that despite the clear message sent by the St. Louis jury, J&J will fight the verdict as they have done with previous talcum verdicts. If you or a loved one were injured by a drug or medical device, you may be entitled to compensation.